In the end I settled for an orange binding and I'm going to use the same binding for my Winter Forest Quilt. 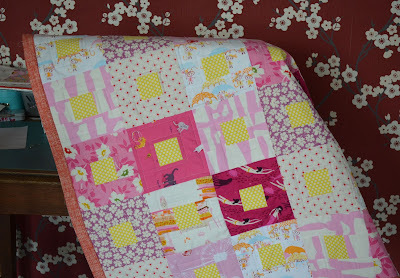 The binding is made with an organic fabric called Orange/Red Fruit Punch by Timeless Treasures and I love it! 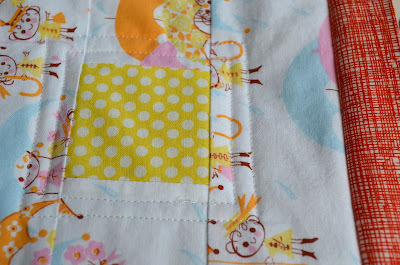 Now I have learned in the past couple of years how to sew a binding on a quilt. I even got the hang of making passable mitered corners. I always sew the binding to the front with my sewing machine (and hand sew it to back.) The only bit that I still mess up every single time is joining the ends of the binding. Even after reading all the instructions in the quilt books I have. Luckily I have lots of knowledgeable sewing friends on Twitter and Instagram who helped me today so I thought I'd do a little round- up of the tips I received about binding a quilt. Most links are to full quilt binding tutorials in which various ways of how to join the ends are included. Another couple of quilt binding tutorials: Julie of Jaybird Quilts has written an (extensive) series of tutorials on how to bind a quilt. 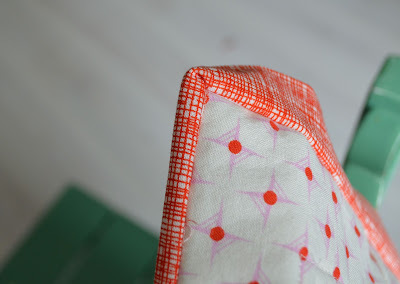 Rita of Red Pepper Quilts shows us how she makes her bindings She sews the front and the back on by sewing machine as does Amanda Jean of Crazy Mom Quilts in this tutorial. Hope one of these (or all) are helpful to you! YES, thank you!!! I searched and search this past weekend for finishing the ends together (like Little Red Hen's tute) and couldn't find it. I had a plane to catch, and just fudged my way through. I am THRILLED that you put this on your website - thank you! I figured that I probably wouldn't be the only one that struggled with this bit. Glad my round-up is helpful! Thank you so much for this post. I want to let you know that I posted a link to your blog in Creative Busy Bee Craft Inspirations, under the Page 1 post on Aug. 17, 2012. Thanks again.